INDIANAPOLIS, IN--(Marketwire - September 28, 2010) - Bringing another first to the dental industry, AMD LASERS™ will offer iPads™ as part of its company-wide going green and paperless initiative effective October 1, 2010. iPad™ technology will replace paper and DVDs throughout the educational and training program in tandem with the number one selling laser in the world - Picasso. The initiative is a part of a long-standing commitment to a greener working environment and AMD LASERS' President and CEO Alan Miller explains it this way, "As a committed entrepreneur, I champion any green initiative which aids in the reduction of our environmental impact. For our company, that means implementing everyday practices such as waste reduction, reuse and recycling -- thus doing our part toward contributing to a cleaner and healthier environment." Including an iPad™ with the purchase of an AMD LASERS' Picasso brand dental laser enables dentists to view patient educational, how-to and clinical videos directly from their iPad™ eliminating the need for DVDs. The iPad™ comes preloaded with an AMD LASERS' App containing all of the videos, marketing materials, operations manuals and everything else that was previously printed. "It is really an all around winning combination," comments Bart Waclawik, COO of AMD LASERS. "Incorporating the iPad™ is a nice win for our clients and company, but more important it's a huge win for the environment. We are proud to do our part." "I hope other dental companies follow suit. We can thank Steve Jobs and the wonderful people at Apple for creating this great technology," Miller added. 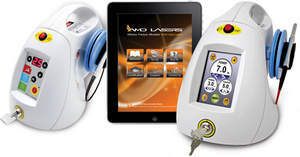 Picasso and Picasso Lite by AMD LASERS are the number one soft tissue dental lasers in the world. Award-winning and endorsed by luminaries around the globe, they combine an ease-of-use, sleek design and affordability. The integration of the AMD LASERS Picasso™ line of soft tissue dental lasers enables every dental practitioner to provide state-of-the-art treatment for soft tissue surgery, periodontal and endodontic procedures, and laser teeth whitening. AMD LASERS is an ISO 13485 and CE registered company. For more information about AMD LASERS, please call 866-999-2635 or 317-202-9530, or visit us online at www.amdlasers.com.